IN THIS EYEWITNESS UDPATE, I take a stroll through central Manchester and look at the amazing transformations which are currently taking place, not all of them for the best. I look at and assess new buildings which have recently appeared, those under construction, those set to make their appeareance, and those which have been, or ought to be demolished. 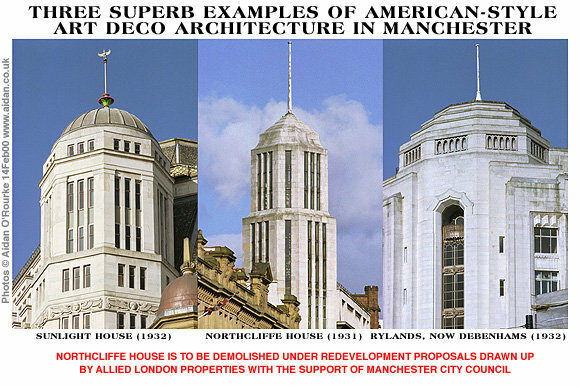 And I muse how Manchester would look today, if post-war development had gone differently. The development of Manchester is characterised by a cycle of destruction and reconstruction. In 1939, Manchester looked mostly the same as it did during the high Victorian era, with a few recent additions, including Sunlight House (1932), Northcliffe House (1931) the Central Library and Town Hall Extension (1934), Kendals department store (1939) and a few others. Buildings in the city centre were smoke-blackened and Manchester and blighted with many old and derelict buildings including thousands of slum dwellings. But the city had preserved its substantial stock of magnificent Victorian buildings including the Town Hall (1874), the Free Trade Hall (1856) the warehouses along Portland Street and Mosley Street (mid-Victorian era), the banks and financial buildings of King Street (mid-Victorian era), shopping arcades such as the Victoria Buildings (1880), the Barton Arcade (1871), the Lancaster Arcade and the Corn Exchange (1905). At the time however - and we tend to forget this nowadays - most older buildings in Manchester were the colour of soot and few people appreciated their value. In 1940 the destruction of Manchester began and it came from the skies in the form of bombs dropped by German aircraft. By the end of the war, hundreds of people had been killed and Manchester was left with many blitzed sites. Losses to the Luftwaffe included the Victoria Buildings, warehouses overlooking Piccadilly, and around Miller Street, St Augustine's Church, Chorlton-on-Medlock, the entrance lobby of Exchange Station, the interiors of both the Free Trade Hall and the Royal Exchange, and many more. But around 15 years after the end of the war, a new and different Manchester started to take shape. 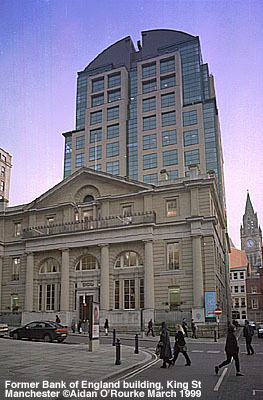 The first buildings to appear included Peter House on Oxford Street (1958, currently threatened with demolition) and the CIS building on Miller Street (1962). Looking at aerial photographs, the transformation of Manchester between 1960 and 1970 can clearly be seen. Most of the blitzed sites were filled in, and further sites were created by the demolition of older buildings. Piccadilly Plaza was constructed between 1958 and 1965, but soon proved to be a failure as a shopping centre, and its brutalist design was widely disliked by the general public. In 1966 it was proposed to demolish all the old warehouses between Piccadilly Plaza and Oxford Street and construct a new office and entertainment complex in similar style to Piccadilly Plaza. There was also a proposal to run the inner ring road through this area, with a highway and underpass at the junction of Princess St and Portland St. Thankfully these things never happened, or today there would be no Chinatown. It's true, many buildings were in a bad state of repair and probably weren't worth saving - the London Road railway station building (1842, demolished late 1950's), for instance. But many viable and historic buildings were threatened with destruction. Watts Warehouse (1858) , now the Britannia Hotel narrowly escaped demolition, as did the Reform Club (1871) on King Street, the former Manchester Mechanics Institute (1854) on Princess Street, and many other buildings. Others weren't so lucky. 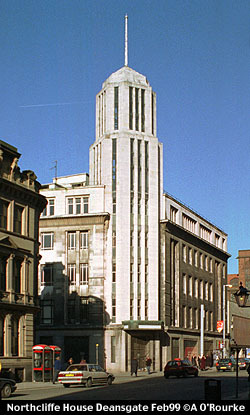 Losses to post war development include: The Milne warehouses on Mosley Street, the Victorian office buildings on Albert Square facing the Town Hall, the Victorian hotel at the bottom of Deansgate near the Cathedral, the Lancaster Arcade near Victoria Station, the Lancashire and Yorkshire railway buildings on Hunts Bank, opposite Victoria Station, the old post office on Spring Gardens, the hotel on the corner of Portland St and Piccadilly, and most scandalous of all, York House (1911), a unique and fascinating textile warehouse which stood on Major Street, next to Chorlton Street bus station. Despite a petition to Manchester City Council signed by leading European architects, it was torn down in 1975 to make way for a commercial development which was never built. I have no photogaphs of my own of these lost buildings - you can't photograph a building once it's been demolished. 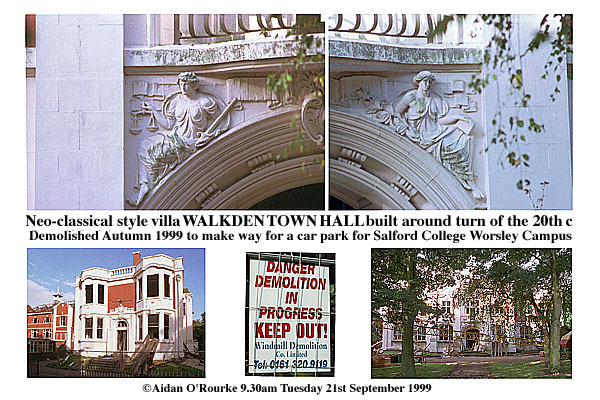 I only just managed to photograph Walkden Town Hall in 1999, just before it came down. In the post-war transformation of Manchester, far the biggest impact on the city centre came in the form of the over-sized Arndale Shopping Centre - in planning from the 1950's onwards and completed during the 1970's, it led to the destruction of the interesting and varied facades along Market Street (apart from one post-war facade which was strangely incorporated into the yellow-tiled frontage), a maze of streets between Market St and Shude Hill, and, dating back to medieval times and still there in 1960, the old Market Place, overlooked by the Shambles. While the Arndale shopping centre has been a commercial success, the exterior with its yellow tiles was soon dubbed 'biggest public toilet in Europe'. The destructive impact of the Arndale exterior on Manchester's reputation, collective psyche and economic fortunes is now mostly forgotten. 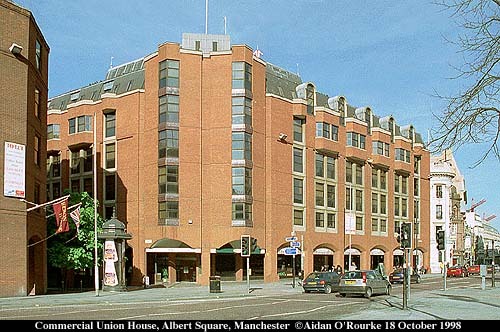 The approval by Manchester City Council of a gigantic shopping mall taking up a whole quarter of the city centre was in essence similar to awarding a monopoly to one massive conglomerate - life was sucked out of the older shopping areas around Oldham Street leading to their stagnation, along with adjoining areas including Piccadilly. It would have been much better to create a number of smaller and competing shopping malls, bringing more diversity to the city centre and saving half of Market Street's Victorian facades, as well as the old Market Place. During the mid-seventies, a new sensibility began to develop - people began to take notice of the destruction being inflicted on Britain's cities and recognised that, with some exceptions, the vision of post war planners and architects was seriously flawed. The most striking example of this was the Crescent shaped flats in Hulme, built in 1967 but classed as slum dwellings by 1971 due to bad construction and design. The Crescents and the rest of the notorious deck-access flats in Hulme were finally demolished in the 1990's. By the eighties, demolition slowed down, but so did new development. Architects tried to mend their ways and make new buildings blend more harmoniously into their surroundings. Run down districts started to develop a new character, such as areas now known as Chinatown, the Gay Village and the Northern Quarter. But the eighties also brought economic stagnation. 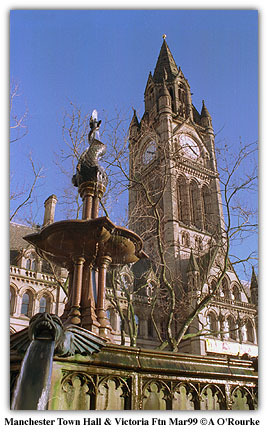 A right-wing Conservative government in Westminster was counterbalanced by a left-wing Labour council in Manchester Town Hall and other town halls in the Manchester area. Nevertheless, the lessons of conservation would appear to have been learnt. 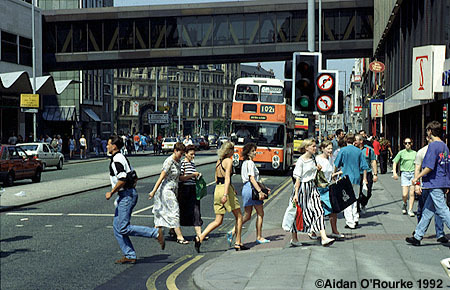 Pedestrianisation had transformed many areas of Manchester including King Street, Market Street and St Ann's Square. Central Station was transformed into the G-Mex centre and work had started on the cleaning up of Castlefield. The change in direction was perhaps most potently symbolised by the decision to restore the Albert Memorial (1866) in Albert Square. Where once a councillor is reported to have said it should be torn down, ground up and used as aggregate for a new inner city ring road, now the council had decided to return it to its former glory. King St, St Ann's Square and Albert Square show what local authority initiative can achieve. 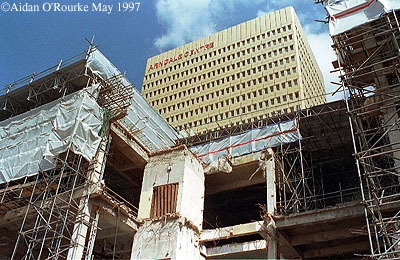 In the 80's and 90's conservation, sympathetic restoration and high quality architectural work would be the hallmarks of all development in Manchester, or so it seemed. 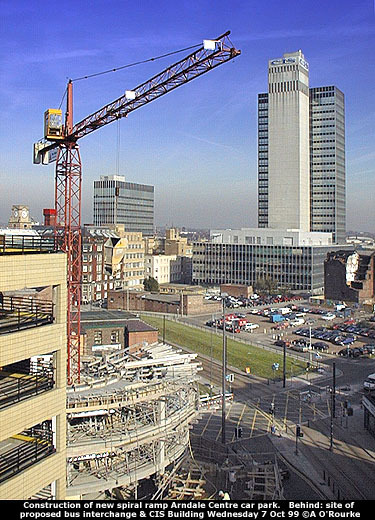 Buildings from this period include the Nynex Arena (renamed MEN Arena), the Manchester Metropolitan University Aytoun Library (1994) and the post-modern tower added onto the former Bank of England on King Street (1995). But a new building boom was just around the corner. It was heralded in a most unlikely form - a massive bomb left by Irish Republican terrorists in a white van on Corporation Street. It exploded at 11.17 on the morning of Saturday the 15th of June 1996. Had the mechanism been faulty and the device exploded prematurely, the IRA would have been responsible for the deaths of hundreds of Mancunians. In the event no-one died, but 200+ were injured. Less precious than human life but still important, a whole corner of our city centre was devastated and familiar corners of our city centre suddenly became memories retrievable only through photographs. What's puzzling is why the terrorists chose this particular location - they could, for instance, have parked the van in front of the Town Hall, or Piccadilly railway station. Instead they chose one of the least esteemed parts of the city centre, the Arndale Centre. Did the terrorists think, in their warped minds, that they were doing us a favour? Or did they just want to paralyse the shopping heart of Manchester? The result of the terrorists' actions was to mobilise a task force, led by a committee made up of local councillors, to bring about the rebuilding of Manchester. Soon, millions of pounds in funds were released - new redevelopment plans were proposed, and the rebuilding of Manchester spread to other parts of the city centre too. Within a few short years, the area around the bomb was transformed, but during this time another spur to development began to exert its influence - the announcement that Manchester would host the Commonwealth Games in 2002. As I write this in 2001, there have never been so many cranes visible on the Manchester skyline. The city is undergoing unprecedented redevelopment - new luxury apartment blocks and new hotels are appearing on familiar street corners, new entertainment complexes have been opened or will soon be opening. Sites that have been vacant for years are now being built on. If you believe the press statements emanating from Manchester town hall, Manchester is buzzing and vibrant, each multi-million pound development adds another piece to a glistening and perfect jigsaw, and everyone is looking forward to a bright new future. But what of the issues of conservation, sympathetic restoration and high quality architectural work? Somewhere, somehow, in the rush of development, with a local council that seems to believe that any development is good development, those ideals are being set aside. Quietly, historic buildings are being lost - the former Hospital for Skin Diseases, Quay St, disappeared around new year 2000. Northcliffe House (1931) on Deansgate is to come down, part of the Spinningfields development. And most worrying of all, the sale of part of Piccadilly Gardens for an office development because Manchester City Council doesn't have enough money to pay for their expensive redevelopment job on the remainder of the gardens. 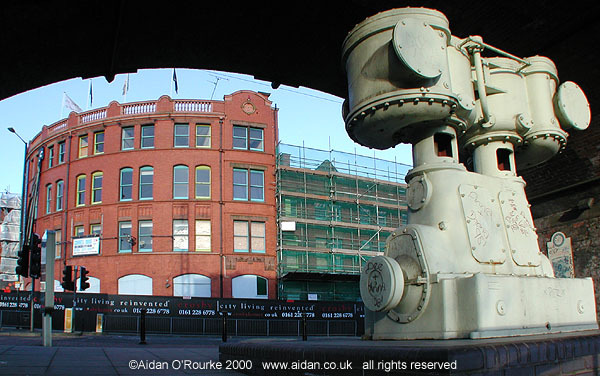 By the late 1970's, due the combined ravages of war and post-war development, Manchester had forever lost the possibility of becoming what it might have become - the Victorian-Industrial jewel of the UK. Just imagine, if things had been different, if the Second World War had never happened, if modernist architecture hadn't been diluted and misapplied, if economic recession had never happened, what if, what if, what if? What might have happened is a fascinating subject, and thinking about it enables us assess new developments more objectively: Instead of saying 'That place is in a terrible state, anything new that spruces it up a bit is to be welcomed', we should be saying: 'In an ideal world, is this really the best possible option?' Apply this principle to the Arndale Centre, the Free Trade Hall and Piccadilly and what do you get? Perhaps with the loss of so much of what was still there in 1939, the present policy of 'any development is good development' is the right one. Piccadilly Gardens had been allowed to decay, so anything is acceptable if it brings some improvement, even if it means covering green areas with an office block. And who cares if an old hospital or a former night club gets demolished - this is post-modern Manchester - where the shock of change is a part of the landscape. Manchester is a magical and fascinating place, more challenging, more contradictory, more mysterious and more multi-faceted than most other cities I can think of. Post-war development has succeeded in causing a rupture between what we see today, and the city as it was before development started. Most people today are alienated from the city's past - , to them, the Manchester of 50 years ago is like an another world. Only by looking at old photographs and using our imagination can we reconstruct in our minds what it was like before the changes of the 1960's, and how it might have looked today if post-war development had gone differently. That strange, forgotten 'other Manchester', which the decision makers would perhaps rather we forget, sometimes has a habit of resurfacing and making us ask awkward questions relevant to today: Those old tramlines that were uncovered on Market St for instance - Was it really the best decision to get rid of the trams? Was it really necessary to make the Arndale Centre so big? Is it really necessary to put an office block on Piccadilly Gardens? 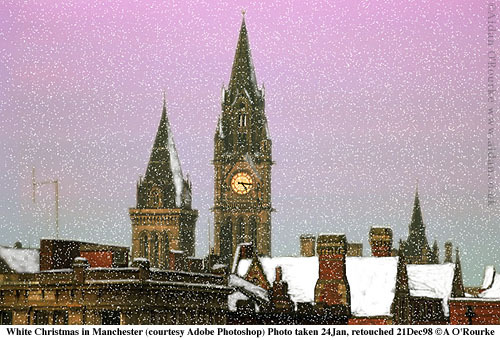 The following pictures and articles present a random and hopefully representative view of how things are looking in central Manchester during early 2001.